Did you know you can stamp and heat emboss on Washi tape? Well, you can!! Just move your heat tool quickly over the tape and the embossing powder will melt perfectly! Do you love that Telephone Brad? Be sure to take a look on the Eyelet Outlet website to grab some of your own! It comes in a package with fan brads. How cool is that? And just for fun, I decided to enter this card over at the Simon Says Stamp Wednesday Challenge Blog. This week's challenge was to use a favorite technique or product. I am trying my hand at water coloring these days...so here I go!! really fun card! 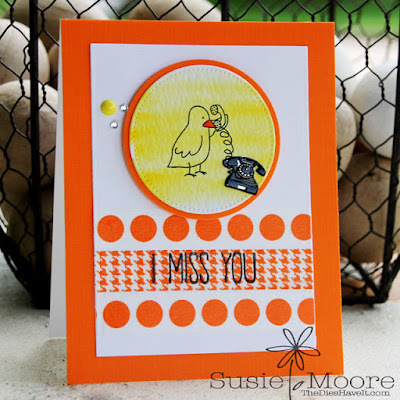 love the bright cheery colors :) thank you for joining us at simon says stamp wednesday challenge!